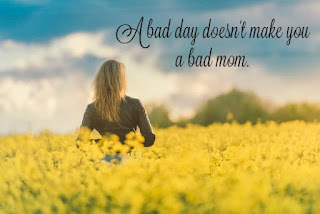 twingle mommmy: Why Aren't Moms Allowed to Have a Bad Day Anymore? Why Aren't Moms Allowed to Have a Bad Day Anymore? I've noticed a trend in our society; no one is allowed to have a bad day anymore. Moms especially are not allowed to have a bad day. We see the judgment all the time over social media. A mom snaps at her child in the store; she's a terrible mother. A kid melts down in the store; clearly he has no disciple at home. Two siblings are fighting; clearly they aren't being raised right. Bad, bad mommy. And on and on the examples go. Oh we read about compassion and some people actually have it, but generally speaking we expect mothers to be on their best behavior and near perfect at all times regardless of the circumstance. I saw a post on Facebook that perfectly points this out. It was a video of a mother yelling at her child to stay by her side. Of course the part that the "good samaritan" left out was that the kid child ran into the street and was almost hit by a car. Yep my panic and fears would have me yelling at my kid too. But hey, just another bad mom right? According to the comments from the trolls the woman deserved to be thrown in jail. First for the yelling and then later for "allowing" her child to go in the street. The truth of the matter is simple; sometimes people just have a bad day. Kids get away in the blink of an eye. Maybe your kid had a nightmare and you didn't get enough sleep. Perhaps your kids woke up fighting and you just need to get out of the house for a change of scenery, only that didn't stop the fighting. Or maybe your kid is just grouchy today for no reason that you can see as a parent. Parenting has softened my edges and made me far less judgmental than my premommy self. Now I understand that you can tell you kid a million times not to run away, but a loose balloon will make them bolt. I also know that children are just young humans who are still learning. They're learning everyday just like the adults. They have bad days and so do we. A bad day does not equal a bad mom. Maybe next time we will remember that when the impulse to pass judgment occurs.